I likely risk being labelled an old fart for pointing that that boxing isn't what it was 'in my day' but there's something to that. We really don't see all that many 'fight nights' worth staying in for. There aren't many big name bouts to speack of nor an awful lot of characters in boxing now. 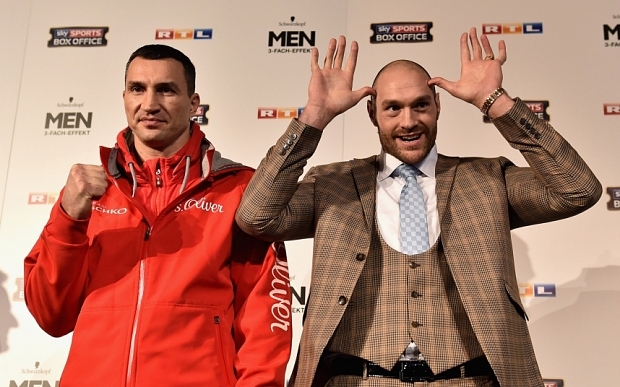 Tyson Fury certainly ticks that last box though. Depending on your point of view, he likely falls somewhere between a character and a nutcase, what with his karaoke moments and often bizarre outbursts. In terms of character, he's quite the opposite of Klitschko in almost every way. Of course none of the theatrics matter once you're in the ring and of the two fighters Klitschko clearly has far more going for him. In terms of his record and boxing ability, other than questioning how exciting he is to watch, Klitschko is a formidable opponent and the few blips he's experienced in his career happened over a decade ago now. Fury, although undefeated has not fought a tremendous amount of what I'd call top flight fighters so could be in for a shock come Saturday 28th. On the plus side for him, he matches his oppoent in stature. As he was in July, Klitschko is 1-4 to win the fight, which is about right in my view. He's not going to make it easy for Fury to get past his guard and is an intelligent fighter. If Tyson does get through though, he has a puncher's chance as Klitschko's main weakness from the past is that on the rare occasions he does get caught, he's not quick to recover. There's not much value in betting at 1-4 really so I would be tempted to go for Wladimir Klitschko by KO, TKO or Disqualification at Evens. I don't think it'll go the distance as I see Fury going all guns blazing in the early and middle rounds in an all or nothing approach. This is Fury's chance to get his hands on the WBA, WBO, IBF and IBO heavyweight titles so I in no way undermine his determination and focus, but I do believe he's got his work cut out.